SF Director Sam Parker and Catalyst CEO Dan Murphy discussed the report recently in an online webinar hosted by the Clean Energy Solutions Center in partnership with the United Nations Foundation Energy Access Practitioner Network, and took questions from an audience including investors, developers and supporters of the off-grid sector. Taking stock after 15 years working on off-grid solutions to energy access, we are hugely encouraged by the progress that has been made.We are seeing scalable solutions emerging and growing commitments from governments and funders to do what is necessary to deliver universal access to energy. At the same time, with only 13 years to go before 2030, we see limited analysis on how much this is likely to cost. In recent discussions with our off-grid energy partners, DFID and USAID, we agreed that more clarity on this would be helpful for the sector. 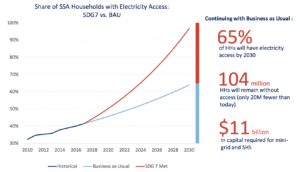 This summer, Shell Foundation and Catalyst Off Grid Advisors set about trying to get a realistic idea of the quantum and type of capital needed to reach the off-grid component of Sustainable Development Goal 7 (SDG7) in sub-Saharan Africa (SSA), defined as all households with at least a large portable system or a solar home system. Over 125 million households in Africa still lack access to modern energy services. Mini-grids and solar home systems have, to date, reached around 1.8 million households (HH). We estimate that with business as usual, we will miss the SDG targets in Africa by about 100 million HH. At the current pace, SDG7 will be missed by more than 100 million households. Projections for the expansion capacity of the grid and mini-grids suggest that their share of 2030 coverage will be in the following ranges, depending on different investment scenarios: 52%-62% grid and 0.4%-2.5% mini-grid. This leaves off-grid solar (OGS) delivering 13% of 2030 coverage in the business-as-usual scenario and 41% in the high investment scenario. The high end of these ranges for grid and mini-grid, result from extreme stretch assumptions: for the grids, projections that are more aggressive than the IEA’s “African Century” investment projections, for mini-grids from 3,000 (today) to 42,000 mini-grids (2030), plus significant progress around cost, modularity and policy reform. OGS is the balancing number, with the model assuming that the 10 market leaders (currently operating at scale in at least one country) would capture 75% market share in the “active” markets of Kenya, Tanzania, Uganda, and Rwanda, and 40% market share of the remaining 44 “latent” markets that do not have more than one company operating at scale. The remaining market share would need to be filled by a deployment serving quarter million customers. 41% for OGS is a very significant share and implies a step change in growth to reach the 100m HH shortfall. A word on mini-grids. 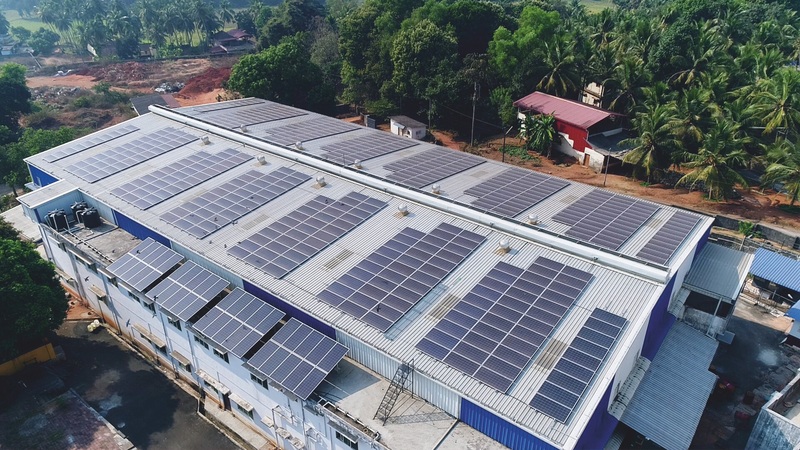 Even at 2.5%, we see mini-grids as a vital part of the mix, given how they trigger very significant economic growth, including productive use and SME development, and enable wider impacts to be achieved. The 42,000 in the previous chart is a huge vote of confidence for mini-grids. To calculate how much capital is needed, we took actuals from known companies, assumed the typical company funding journey: early stage grant funding, debt, equity and facilitation funding for incentivising leaders into new markets. We segmented the countries into groups (active, big three and frontier) to at least start to reflect the market architypes. We did a top-down, market demand analysis and a bottom-up, supply side costing which showed that by 2030we have: 7.5 million (top down)/7.5 million (bottom up) HH served by mini-grid connections, 103 million (top down)/125 million (bottom up) HH served by connections from OGS. This requires $31/22 billion commercial capital ($7 billion of which is mini-grids), including $1 billion catalytic grab/blended capital, plus funding for a $4 billion affordability gap for the poorest who cannot afford entry level systems (N.B. we see it as totally legitimate and non-market-distorting to fund this $4 billion gap, given grids are commonly susidised – we cannot ignore it). From a methodology perspective, it was reassuring to see that two completely different, top down/bottom up analyses came to broadly similar results. SF experience shows that establishing and scaling a SHS off-grid deployment in one country takes years and millions of dollars. Quantum: The $1 billion catalytic grant/blended capital does not exist, so we will not generate the pipeline without finding more of this. The late stage commercial capital is probably there for de-risked opportunities. Capital finds good opportunities. Type: There is a clear financing type gap between early stage (mainly grant, convertibles) and late stage (commercial) capital, which is proving to be a critical blocker to sector growth. We are calling this the “growth stage” funding gap, defining growth stage as being companies with a typical profile of: ~ $2- 15 million revenue, $5-$100 million assets, already with a blended funding stack, with a validated product, not yet EBITDA +ve but with a clear path to breakeven, and a strong management team in place. Growth stage companies generally find that funds are structured more to meet investor needs than theirs and often come with terms that are inaccessible or highly risk averse. This accounts for our experience working with growth stage enterprises over the last 10 years, where we see CEOs spending a big proportion of their time fundraising. So, as per the grant component, without more growth stage funding, we will not achieve the sector growth needed. For early state companies, we need more patient grant, repayable grant, convertibles, to build the pipeline for the 278 deployments. This capital is increasingly scarce and is likely to require some form of syndication between foundations, strategic corporates, commercial investors, impact investors and DFIs to reach the quantum required. We would argue that the only way to provide enough growth stage capital to read SDG7 is that bridge vehicles are funded by later stage investors, who have an interest in building pipeline. Whilst we do not expect later stage financiers to change their core investment principles, it is feasible that DFIs and impact investors can identify pools of grant/bridge capital, either internally or from partners, and establish formal linkages where grant/bridge capital graduates to commercial capital. 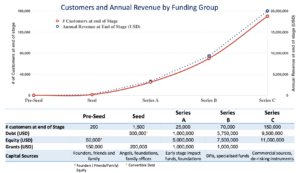 Taking this idea further, if we could find a way for the sector to allocate $1 to early stage funding (of which, say, 30% grant and 70% bridge finance) to invest in seed to Series B stage companies, for every $10 of commercial finance to invest in later stage companies, we could begin to see the acceleration we need to reach 100m HH. A bold start would be for a group of funders to construct a facility of around US$250 million early stage funding, which would catalyse $2 billion of later stage investment. From an enterprise perspective, 298 deployments are needed and $26 billion, including $943 million in catalytic grants. Public sector will need to be involved to realise the full potential of the sector. This is already demonstrated in the “active” markets. The study suggests that the strong interaction already taking place in these countries will need to deepen further, as business-as-usual scenario shows some of these markets still falling short of universal access. There are a number of markets which are either too small or too fragile to attract private sector without incentives. Nevertheless, they play an important part in achieving SDG7. In these markets, we believe it is inevitable that closer partnerships between government and private sector will be needed. The private sector will need to be reassured that this does not necessarily mean market intervention or distortion. There are a wide variety of measures possible, and would only be needed where private sector wasn’t stepping up unassisted. There are clearly differences between the markets categorised as “latent” in the study, so different tools (see below) will need to be applied to different contexts to ensure the public funding ends up with those that need it most. Bidding for participation in markets can be attractive for the private sector, if there is confidence that rules of engagement and regulatory arrangements are clear and will be respected. 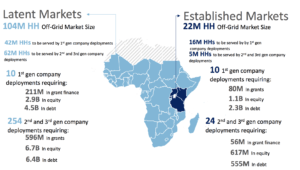 For off-grid energy, bidding for market participation could not only attract the new generation of off-grid companies into frontier markets, but also established service companies (e.g. utilities) partnering with off-grid companies. Clearly, any arrangements curated by government need to avoid the disadvantages of traditional concession approaches which have had a mixed history. Each country is best placed to select the measures most suited to its needs. Licensing, tenders, results based payments, smart subsidies and tax exemptions are all models which have worked in different industries. Whilst district-level concessions are usually applied in on grid settings, there is potential to design variants tailored to off-grid services, especially in areas where there is an interface with the grid. Well administered, such schemes can also attract longer term, more competitively priced infrastructure finance. Our view is that one of the pre-conditions for success will be dedicated local capacity, with a mandate to provide neutral (i.e. working equally in support of private sector, government and consumers) institutional support to building a functioning market in each country. If based on a detailed understanding of local context, and of the needs of private sector, it is more likely that arrangements between government and private sector are kept as light touch, targeted and practical as possible. Ideally, such arrangements would not be needed; however, without them, it is quite possible that, in some frontier markets, off-grid energy companies may not enter at all. Government capacity is often limited in this area, and for those countries which do decide to explore these approaches, there would be a clear need for capacity development through exposure to other countries with a more developed off-grid energy private sector. The sector needs to see the entry of more established companies into the market, not just from the power sector, but also from related sectors (e.g. information, telcom, logistics); it is good to see the starting. We see this as greatly assisting both off-grid enterprises and SDG7. Off grid companies have deep knowledge of customers and how to serve them. Established infrastructure and service companies have access to lower cost capital, market reach, expertise and R&D capability. That’s a great combination. We anticipate a gradual fading out of the terms “off-grid” and “on grid” as modern energy companies increasingly make efforts to serve both. This analysis in no way intends to imply that it is just about the funding. It is well documented that finance must go hand in hand with business support to growing companies and a supportive market environment. There is also a lot of work needed to improve margins, so many more companies can reach profitability. Shell Foundation has documented its learning in this regard from over 15 years working with social enterprises in our 2015 Enterprises 2030 Report. As we finalise our 2018-2022 Shell Foundation strategy, alongside our core building enterprises, we intend to allocate resources to help create the financing tools needed to reach SDG7. We are strengthening our team in finance. Setting up bridging vehicles will be a priority and we aim to launch our first one in partnership with FMO and DFID in the next quarter (Energy Entrepreneurs Fund). We are also looking to establish a bridge facility and explore using a portion of our endowment to anchor it, in partnership with a number of other funders. Energy Partnerships that we have co-founded, to overcome market constraints, align investments and provide the patient capital that is so plainly needed to unlock further financing for energy access. Through these actions, and by forging new partnerships with others, we continue our commitment to making the goal of universal access to energy a reality.